Living life is about enjoying the finer things. This could be looking out at the rain on a cold winter’s day while you’re warm in your home or watching your absolute favorite classic film to cheer you up on a particularly gloomy day. It could also be a super cute video that just so happens to have gone completely viral! Finer things also include spending time with your loved ones, I know this is my favorite way to spend my time off. Are you ready for your “aww” moment of the day? Good! Because below is a video that’ll melt even the coldest of hearts. It’s a rendition of the popular Toy Story song “You’ve Got A Friend In Me” sung by a father and his toddler. One might believe that many have been attracted to this video because the singing is not all that good, but rather adorably offbeat and off tune – the toddler is four years old after all. But this is not the case. In fact, this girl’s singing voice will knock your socks off. Both dad and daughter took the time out to give you this raw and cutesy performance that’s coming straight out of their living room, and their hearts! I bet you’ll want to watch it a couple of times over. 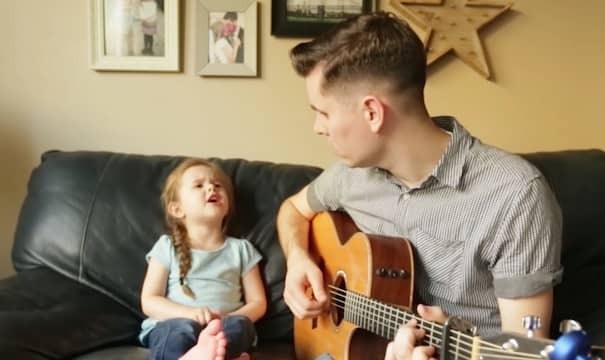 David Crosby, a 28-year-old father from Utah, and his four-year-old daughter Claire Ryann recently made viral status because of their chilling YouTube video of the pair singing together. The video starts with David singing the first verse of the song while his daughter sits there quietly and waits. When the second verse comes around, you almost expect her to mumble softly while trying to remember the lyrics but instead, you will bear witness to an absolute star in the making. Claire sings with her whole heart, hits every note and gives those who hear her, goosebumps. David came up with the idea of making a video with his daughter when Claire persisted to sing loudly at a gas station one afternoon. It is said that many complimented her for her great singing ability, which David agreed with wholeheartedly. Now, the duo sings together in order to share their love of music and to have precious father-daughter time together – and the Internet could not be more grateful. The video currently has over 6 million views on YouTube! See the truly inspiring video below and – if you’ve been moved – share it with your family and friends.